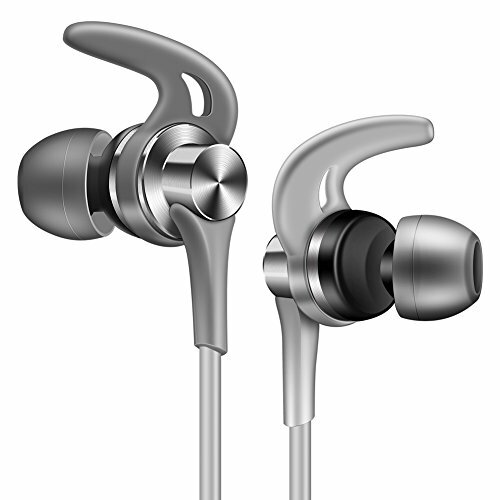 ONTBA SoundSport In-Ear Headphones Sweatproof with Mic Noise Cancellation Earbuds for Android Devices and More (Gray) by ONTBA at Got Busted Mobile. MPN: 43308-4299. Hurry! Limited time offer. Offer valid only while supplies last. Reach Maximum Comfort Adopted silicone for the ear-hooks that enable earbuds not just stay perfectly in your ear but make you feel much comfortable. Adopted silicone for the ear-hooks that enable earbuds not just stay perfectly in your ear but make you feel much comfortable. Offer HD stereo sound quality and support answer via Mic with one button. Superior Gray make you look good while listening to music or making call. This World Left Nothing But Only You And Your Music. Ergonomic Double Layer Design for most ear size: Earbuds fit perfectly in ear for most size ear canals according to plug it in certain deep of your ear, and the soft and flexible silicone in ear-hooks enable it to fit and stay in ear perfectly avoiding Sliding out. Noise Isolation reduces surrounding distractions. Calls come in clearer, even in windy or noisy environments, with noise-rejecting dual-microphone system. Sweat and weather-resistant; engineered and tested for lasting quality and durability. Lightweight and Advanced design make maximum comfort and fashion. What you get: 2 pairs eartips in different sizes and 1 earphone; 1 year worry free warranty and 24 hours online customer services. If you have any questions about this product by ONTBA, contact us by completing and submitting the form below. If you are looking for a specif part number, please include it with your message.